EXTRA CREDIT: Read Nancy’s wonderful article on Arc of Appalachia about her organization’s part in restoring wildness in southern Ohio. Nancy Stranahan serves as the Director of the Arc of Appalachia Preserve System, and was one of the non-profit’s founders in 1995. In the span of directing the organization over the last 20-plus years, Nancy has cultivated a vigorous citizen advocacy network in Ohio, what Nancy likes to refer to as a tree-roots network. The Arc has saved and preserved over 7000 acres of natural areas in Appalachian Ohio, representing 21 preserve regions and over 100 separate real estate negotiations and fund-raising campaigns. The Arc’s headquarters, the 2500-acre Highlands Nature Sanctuary, is the Arc’s largest and oldest preserve region, and is the hub of the Arc’s primary visitor services, offering over 16 miles of public hiking trails, overnight lodges, and an interpretive Museum. A few of the many rare and common signature species protected within the Arc suite of nature preserves are Henslow sparrows, cerulean warblers, golden star lilies, northern long-eared bats and timber rattlesnakes. Under Nancy’s guidance, the Arc has also been instrumental in saving several 2000-year old Native American earthwork complexes, notably Spruce Hill, Glenford Fort, Junction, and Steel Earthwork sites. In addition, the Arc manages two long-protected earthwork sites – Fort Hill and Serpent Mound – working as a contract manager for the Ohio History Connection. 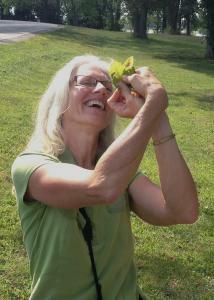 Previously in her career Nancy served as Chief Naturalist for Ohio State Parks with the Ohio Dept. of Natural Resources; and operated Benevolence Café and Bakery in downtown Columbus’ city market for 20 years, where she promoted healthy and intentional food choices.